64 pages. Illustrated in color throughout. Paperback with poster dust jacket. Published on the occasion of the exhibition David Salle: New Paintings, this catalogue features full plate images and details of work from two recent series: Late Product Paintings and the Silver Paintings. 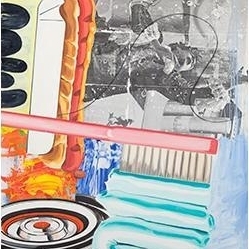 Accompanying the reproductions are studio photographs and an interview between David Salle and writer Bill Powers. In Salle’s Silver Paintings, photographs of the performer Massimo Audiello posing in front of unfinished paintings from the Early Product Paintings series have been transferred to canvas using a variety of non-digital techniques. In each case, the results are unique and unrepeatable, leaving traces of blank canvas that interrupt the image and emphasize the surface of the painting. Salle’s initial interest in photography lies in the medium’s ability to break the subject down into a schema of lights and darks, which can then be translated into paint.